In the early hours of Sunday morning, before many of the patrons had bothered to show up at the National Stadium in Singapore, Canada took care of business. Their victory over Japan caused no ripples and raised no eyebrows, but its significance was not lost on coach Damian McGrath or his players. In the grand scheme of things, few took note. There were no medals at stake, no Olympic berths on the line. But look a little closer, and Canadian Sevens rugby posted a result critical to its ailing health. In the early hours of Sunday morning, before many of the patrons had bothered to show up at the National Stadium in Singapore, Canada took care of business. The Canadians' 33-14 victory over Japan caused no ripples and raised no eyebrows. I am certain, though, its significance was not lost on coach Damian McGrath or his players. Connor Braid set the tone. Canada's best player scampered in to open the scoring within the first minute, adding to his impressive tally. It is now a team leading 24 tries and counting for the flame-haired flier from Victoria, who is enjoying a career season. Canada's win keeps Japan just where it wants them — in the rear-view mirror. At a time when all the talk is about Olympic qualification, Canada continues to glance nervously over its shoulder. It cannot get preoccupied with how to navigate a route to Tokyo when there is still salvage work ahead on the World Sevens Series. Japan achieved its best result of the season in Hong Kong. It coincided with Canada's worst. The Japanese, who have flirted with the relegation trap door all season, managed to close the gap on their fellow strugglers. The positivity was fleeting. Japan's loss to Canada, followed by another to Kenya in Singapore, keeps them firmly planted in the ejector seat with just two events remaining. For the good of the global game, Japan needs a competitive team to showcase at the Olympics. But the team is in grave danger of losing its core status to Ireland. Canada has bought itself some breathing space. The win over Japan allows Canada to prepare for London with a 19-point margin of error. When the Series points are all totaled up after the grand finale in Paris, the Canadians, I'm sure, will be safe and sound. Only then can they think about what comes next. I believe Jake Thiel has a big part to play in that vision of the future. 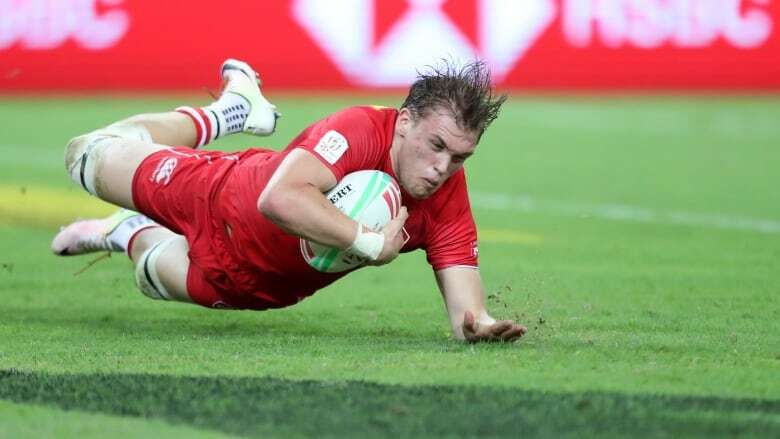 Not for the first time, Canada's youngest player caught the eye with three tries as his education continued in Singapore. Thiel comes from good stock. Both his parents represented Canada at Rugby World Cups, and now young Jake is starting to become a key cog in the machine. At 21, the baby of the team is beginning to show the promise of a player who could be a fixture on this roster for the next decade. He can take his cues from the likes of Braid and Justin Douglas. Thiel needs to stay healthy, of course, but more importantly he needs to enjoy his rugby. As long as he can perform with youthful power and enthusiasm, the outlook is bright for this talented newcomer. Let's not pretend, however, that this was anything other than another lacklustre effort by the Canadians. They were outclassed by both Fiji and South Africa on day one, but used their collective experience and commitment to regroup and beat the Scots and Japanese. Canada has taken a mighty fall since winning the Singapore event two years ago. The opportunity to build on that 2017 breakthrough win was missed and now it languishes toward the back of the bus. Proud players will battle on regardless, for they know no other way. In the dog-eat-dog world of professional sport there is no room for mercy or sentiment. A team does what it must to achieve some measure of success. If, as seems likely, Japan is relegated going into an Olympic year, Canada cannot be blamed. Canada must protect what it has. In its own error-strewn, battle-weary way, it is trying to remain among the elite of World Sevens rugby. The Canadians are doing just enough to keep their heads above water. For that effort alone, they cannot be faulted.